Satay is traditionally a dish of marinated meat which is then skewered and grilled. It is commonly served with a peanut-based dipping sauce. 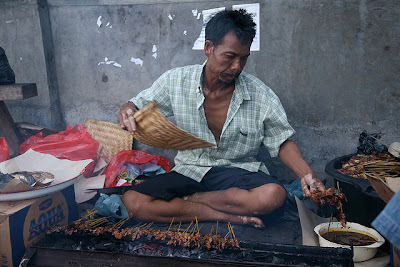 Satay possibly originated in Java or Indonesia, but now has variants in Malaysia, Singapore, Brunei, Thailand, the Philippines and even the Netherlands. One must remember that Indonesia was at one time a Dutch Colony. Chickens on a window ledge in Bali. Satay can be found in virtually every Thai restaurant. The usual meats are chicken, beef, mutton, squid, rabbit or venison. More exotic meats have been used as well, including snake, turtle and crocodile. 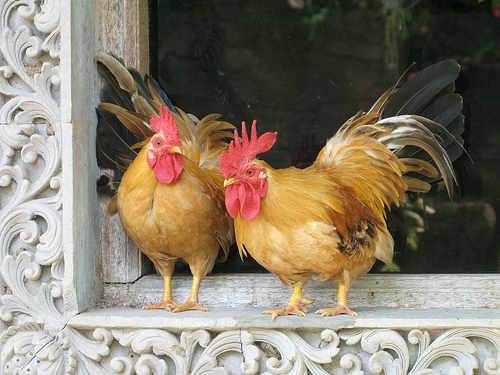 Traditional marinade ingredients include sugar, soy, green onions and salt. Turmeric is always an ingredient as it is what gives satay its distinctive yellow colour. A peanut based dipping sauce is then made for dipping after grilling. Well the weather here in Nova Scotia isn’t quite good enough for grilling right now, but I wanted satay. Or perhaps I should say I wanted the “flavours” of satay. So I examined several recipes and reconfigured the ingredients to make a non-skewered “satay-style” chicken that incorporates the “dipping” sauce directly into the dish. I do have to say it turned out rather well. Make no mistake, this is as far in look from a traditional satay as possible, but all the flavours are there. This is a recipe you should really try. It comes together very quickly after the chicken is seared and is a filling main dish. 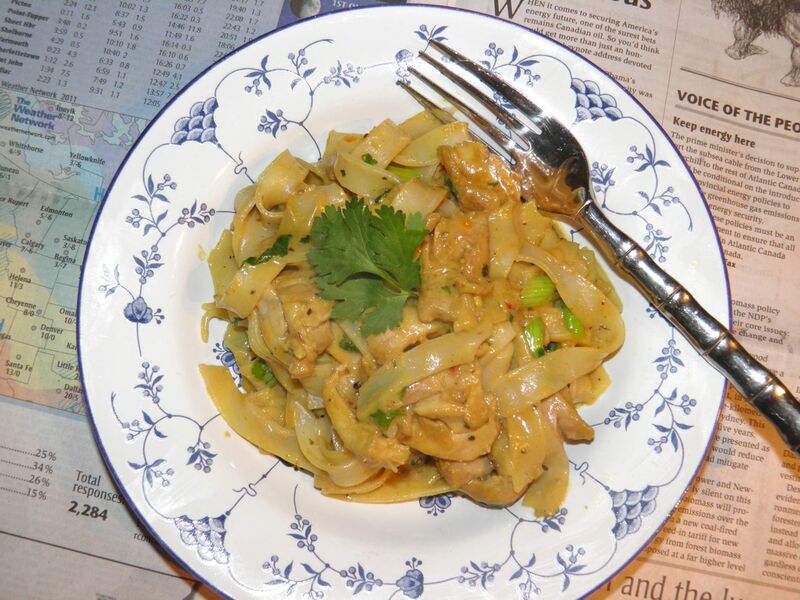 This chicken recipe takes the flavour of a satay marinade and combines them into a sauce that is superb tossed with wide rice stick noodles. Soften the noodles in hot water as directed by the package. 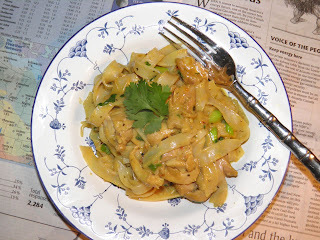 Mix together the sauce ingredients in a small bowl: 1/2 cup of the coconut milk, peanut butter, soy, lime juice, sugar, fish sauce, turmeric, coriander and basil. Heat the oil in a wide saucepan with a cover. Sear the chicken until browned on both sides. It will still be raw in the centre. Remove. Chop into medium large pieces. Sauté the garlic, ginger and chilli for 1-2 minutes in the saucepan. Add the sauce ingredients and simmer for 2-3 minutes. Add in the remaining 1/2 cup of coconut milk and the chicken pieces. Coat well with the sauce, cover and simmer on low for 5 minutes. Add in the green onions and cilantro. Add the noodles and toss to coat. Serve with more cilantro and lime if desired. *Time includes searing the chicken. After searing the remainder of the recipe comes together very quickly.